Are you gluten sensitive, lactose intolerant or simply interested in improving and maintaining your health and overall quality of life? Do you want to learn how to make delicious healthy food and thrive every day? Everything is possible now due to the magic of Living Foods! Inspired by the International Woman’s Day, Bettina and Monica team up to share some of their secrets with you and to bring light into the astonishing world of raw vegan gourmet foods. You would like to try a plant based diet but you are scared and don’t feel ready to quit the dairy cheese? This is the perfect workshop for you. 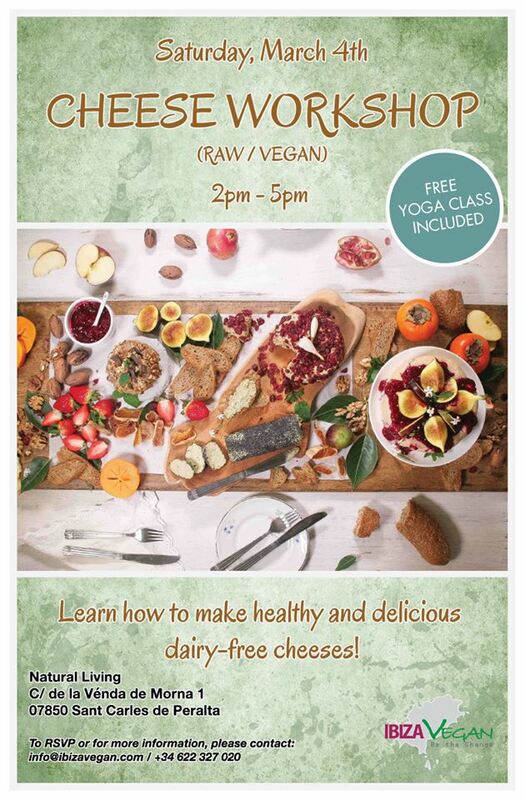 We will show you how to prepare a variety of raw vegan chesses that you could grate or cut in slices. At the end of the workshop we will all decorate a big wooden cheese board taking as an example the one from our promotional flyer. Isn’t it really beautiful? We want to say THANK YOU Natasa and Marina for letting us use this great picture. You can find more information about them and delicious recipes on the following link: www.enhealthy.com. We finished with the salty snacks and its time to talk about….SWEETS! We have a mouthwatering recipe to share with you all attending. You will definitely impress your family/friends when you will prepare it at home. ♥ It’s our secret, ssssssst! Celebrating the International Woman’s day with flowers and happiness. We will open our heart to be able to receive a lot of love – during a yoga class with Bettina (starts at 14h at Natural Living). The class is optional and included in the price. Those not attending to the yoga class but willing to attend to the workshop please come not later that 15h. Bettina Knapp, certified RYS 200 yoga teacher specialized in Vinyasa Flow, holistic nutritionist and whole food advocate is excited to share her passion for nutrition and health. Through clean nutrition and yoga we can let go of toxins in body, mind, and soul, and make space for new, exciting things to come! Monica Tarba, private chef, event organizer and vegan and raw vegan lover, is the founder of “Ibiza Vegan (www.ibizavegan.com) and “Vegi Tales” (www.vegitalesibiza.com). To receive further details, make a reservation and get the payment instructions, please send an e-mail with your full name and contact number to monica.vegitales@gmail.com.